A traveller comes to a small village. Producing a large pot, and a stone, he asks the village folk for some water with which to make stone soup. The reception is sceptical. Stone soup? But someone brings the water, and the stranger sets about making a fire for the pot. Word spreads. A crowd gathers. Soon the stone is bubbling away in water. The unlikely cook asks, might someone be willing to spare a dash of salt or pepper for flavour? The villagers, now intensely curious -- the soup is nearly ready -- scrounge for a sprig of this, a scrap of that, and slice of something else. All go into the pot; simple garnish for this absurd meal being coaxed from a stone. Yet before long, everyone has eaten their fill, and they can but wonder at the stone that has somehow managed to feed them all. Storytelling, in all its forms, has been a central interest of mine for a long time. More recently it has become clear to me that it's the fundamental and age-old artform at the heart of futures practice. But this post is about something else. On moving back to Australia from the US late last year, I'd been thinking about running a regular event, built around the sharing of stories from personal experience. I asked around, and didn't hear of anything already going on in Melbourne quite like that. The seed had been planted by the example of some friends in San Francisco. They have been running something called Fireside Storytelling every month for about eight years. I'd also attended its younger, lewder cousin, Bawdy Storytelling, as well as Porchlight, a series similar to Fireside. All are enjoyable and popular events; an evening's theatre founded on a participatory ethos and community atmosphere. The month after settling into my current apartment, I was finally established enough to make things happen. Intending first to try it out at my place after work on a Thursday, I figured people would be hungry, and that the gathering could feel awkwardly stagey if stories were the only component. So I folded a potluck dinner into the invitation too, thinking that ingredient could drop away after one or two rounds, and we might then look at scaling up to a more professional performance-type affair at a real venue. The first night was themed 'Far From Home'. Almost everyone has a travel story they enjoy sharing -- the makings of a nice, novice-storyteller-friendly start to the experiment. A dozen people came, and five or six of us shared stories. It was a wonderful evening, more than enough encouragement to do it again. The home setting and potluck dinner (mostly vegetarian for maximum shareability) worked beautifully, and so they stayed. We've now held this event six months in a row, and it has been terrific every time. This is Stone Soup. It is a community potluck and storytelling evening: bring a dish, and, if you like, a story to share inspired by a given theme. Between a dozen and 20 people attend. Twenty seems sort of a practical upper limit due to the size of my kitchen table. It might go well with smaller or much larger numbers; we'll find out at some stage. 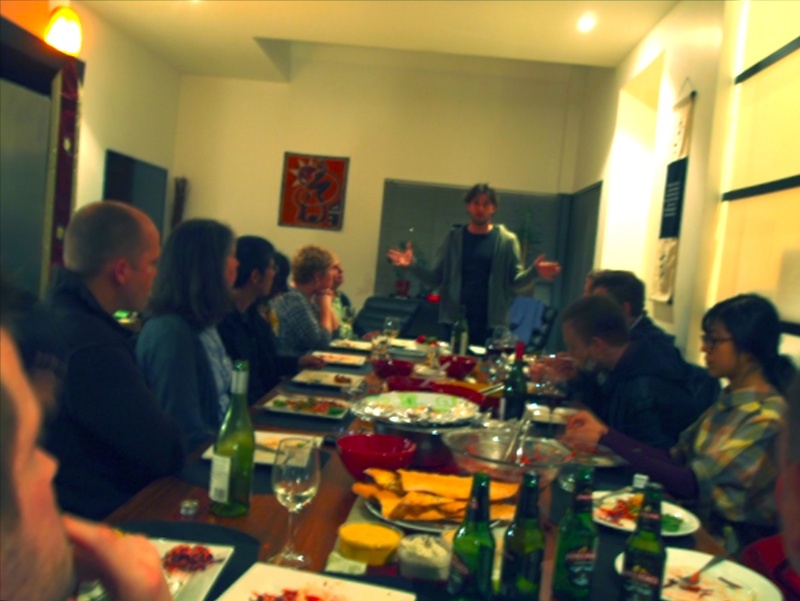 Stone Soup deliberately does not work or feel like the usual informal sharing of stories at a dinner party, or down at the pub. Nor is it as formal as an evening's theatre. It is a mixture; light-touch ritual. The storyteller stands at the head of the table, so is 'on stage' a little bit. The dynamic's on a borderline between that of a gathering of friends and one of strangers. As the host and primary guest-wrangler, I'll already know most -- but not all -- of those around the table. Because of an invitation only and word-of-mouth approach to filling seats, some of the participants always know each other too. So there's a baseline of familiarity, and also a getting-to-know-you element, bridging towards each other. It's interesting to me how Stone Soup seems at once both new and old. The breaking of bread together and sharing of stories speaks to instincts at least as ancient as humanity itself. We've found also that it touches on something quite contemporary, a lack or even a longing many of us feel; for connection to those around us by startlingly simple and direct means. Although this event is by no means unique in doing that, it does seem to do it in a unique way. A variety of people have taken part so far, and all remark on how different it feels from the rest of their social calendar. Even my most socially active friends and dinner hosts find Stone Soup intriguing and, somewhat to my continuing surprise, novel. It is a pleasure to listen to other people's stories, and a different kind of pleasure to tell one's own. Sharing like this, it seems we ennoble and elevate one another. In particular, there's a species of focused attention that is striking to experience as an audience member -- and especially as a storyteller. Having done a little bit of stage acting, and quite a lot of public speaking, I find Stone Soup significantly different from both scripted performance and intellectual improvisation. It's intimate, empathic, communal, and personal. Aspects of the storyteller's personality are telegraphed with startling clarity to the room; ways of thinking and feeling, their presence, amplified. On the other side, there's also a sense of rediscovering your own story in the telling, with reactions revealing things as comical or strange in a way you may not have recognised before. A couple of participants (Kaila Colbin, Julian Waters-Lynch) have written about what taking part has taught them. As the name suggests, Stone Soup is not hard to make, yet the results are highly gratifying. > Anyone can tell a story, but no one has to. We've thought about making it "everyone brings a story". That'd be a fine event too. But sometimes you just want to listen. This way accommodates differential levels of comfort, energy, and extroversion, and makes sharing a story an option rather than an obligation. It also tends to awaken on the part of passive listeners a desire to 'pay it forward' by sharing a story at future events. > There's a theme. This is provided in advance, with the invitation, say 2 or 3 weeks ahead, so people can be thinking a bit about stories they might share. The theme lends a cohesion to the evening, pointing it in a different direction each time, so it's worthwhile to keep coming back. Even if someone decides not to share a story, their thinking about the theme in advance lends a certain alignment, and to the actual procession of stories the delight of now complementary, now mutually resonant interpretations - "I never would have thought about that angle". Our themes so far have been 'Far from home', 'That was when I realised', 'Three', 'Mystery', 'Magic', and 'Unfinished Business'. > Half-prepare, half-improvise. In almost every case, I have had no idea what stories people were planning to tell, just whether they have something ready to go or not. Lining up the first batch of storytellers in advance, generally as they arrive, helps it run smoothly, so as the host I know we have at least the beginnings of a program. The first storyteller is especially important to set a tone. The break after the first half is a good time for people to serve themselves seconds or switch to dessert. Once people are relaxed, have had some wine, have heard a few stories and begun to get a sense of the theme, then the other half takes care of itself. > Stories come from personal experience. This is a very accommodating principle. One person brought a poem. Another read out some love letters she'd received via Facebook. One distributed props he'd created especially for the occasion. For the evening 'Three', a trio of attendees jammed together during the break on musical instruments they'd brought along. Stories can be any length, but around ten minutes seems a good time to aim for. > One storyteller at a time. At Stone Soup in Melbourne, I invite storytellers to a 'stage', standing at the end of the table. By design, this sounds a mildly formal note against a congenially informal backdrop. I introduce storytellers by their full name, and we applaud to welcome them to the stage as well as to thank them for their story. I'm told it's slightly intimidating -- but only slightly; and usefully so, as it makes the telling of a story just enough of an accomplishment. Stories delivered while seated at the table are great too, and we've done some of that as well. It has a nice informal air, but the inevitable backchat and ensuing conversation tends to spin focus away from the storyteller's moment, which is paramount. The other day we had a double act - one storyteller, accompanied by a first-timer who turned out to be an absolutely mesmerising violin player. But the focus of the room was not in doubt for a single moment. > New blood is important. We aim for a third to one half new people each time. This is part of what gives the creation of group intimacy its significance. Each month we send invitations out to the growing list of previous attendees who have expressed interest in coming back. The fastest RSVPs get the seats, and all have the option to bring along any guest who hasn't come before. This growth of our little circle means demand is quickly coming to outstrip supply of seats at the table. This is good. Supply exceeding demand makes the event more special - and sooner or later may motivate people to run Stone Soup events themselves. Friends in Christchurch, Sydney, San Francisco and Chicago already have plans in the works. > Participation rules. Stone Soup is people (cf. Soylent Green). It is more than the sum of its parts -- but it does need parts. As I've said once or twice during an expectant silence around the table in the improvisational phase: for the soup to work, you have to put something in the pot. As a host this means being willing, not to dominate, but certainly to share yourself: open up the space, and then if necessary, set an example. I'm far from being the best storyteller to have taken the stage at Stone Soup, but I am learning a lot by running it, and the willingness to share my own delights, embarrassments, and reflections has proven altogether broadening. > The best stories are the most generous. It's not necessarily the event-driven fireworks of a death-defying experience that make for a compelling story. A moment in the midst of everyday life, experienced in a certain way, sets itself apart as extraordinary and powerful revelation. Related evocatively, it can become that for the audience too. The best story is in the telling, and the best telling is in the revealing. So the most important ingredient for any storyteller to bring, I've come to suspect, is generosity. As a storyteller, if facing a choice between two possible stories, the one that shows more of myself -- though possibly more uncomfortable to tell -- is the more meaningful. So there's one way to make Stone Soup, subject to change, of course, as we experiment and learn. 'Stone Soup', an old European folktale, has always appealed to me. It's about a situation where the whole amounts to more than the sum of its parts. It's a parable of community. It is also, I now think, a trickster story* -- a trick of the most wonderful variety, the scam for the greater good. It is in that sense a tribute to the commons. The stone is of course a pretext for bringing other elements together -- a MacGuffin -- and the substance of the story, the magical synergy that transcends additive arithmetic, as of our eponymous event, is in the way it elicits a willingness to contribute and to commune. And Stone Soup has led me to think more deeply about storytelling. Thankfully, and contrary to my earlier concern and impression, I no longer think of it as a dying art. But it has in short order, historically, become a latent one: we're more passive than ever before in the face of narrative artforms professionalised and commoditised in the space of just a couple of generations. Don't get me wrong -- I am myself an avid lifelong consumer of such products. But at the same time we owe it to ourselves, I think, to tell our own stories, to develop this most basic of human capacities, and thereby to connect more closely with the people in our lives. Let me invite you to try making Stone Soup for yourself. And then, please; come back and share your story. * This is Lewis Hyde's influence: having read Trickster Makes This World and The Gift back to back last year, these two wonderful books continue to rework how I see things. Thanks to Julian Waters-Lynch and Rolf von Behrens in particular for their encouragement and involvement in getting this event up and running. Cheers to Fireside Storytelling and especially Tim Pratt for the inspiration. Stone Soup snapshot at header courtesy of Erick Mitsak. I was interviewed recently for Architecture Australia by editor Timothy Moore about the importance of collaboration in foresight and design for the built environment. 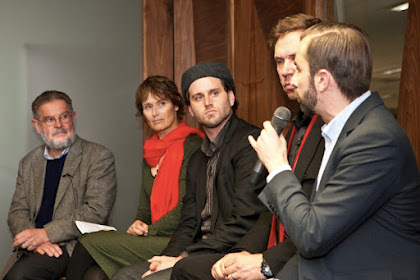 The conversation grew out of an AA Roundtable we did on related themes in Canberra back in May. Both exchanges highlighted for me the great extent to which my work as a futurist within Arup, a global design and engineering firm, consists in providing opportunities for people to share and negotiate disparate perspectives of futures possible, probable and preferable -- as opposed to simply cranking out supposedly futurogenic collateral. I keep thinking of my friend and fellow futurist Jamais Cascio's line, "With enough minds, all tomorrows are visible", a riff on the Open Source dictum known as Linus's Law. The kind of practice that these times call for, especially in the massively multiplayer game of the 21st century city, is built upon a fundamentally Open Source sensibility, a collaborative structure and intent: the meshing of many minds. That means not only that foresight itself should be treated as a team sport (the apt phrase of my former CCA teaching collaborator Jay Ogilvy), but also that for all sorts of design activity, be they explicitly foresight-themed or not, we need to enable significantly more participatory and bottom-up approaches than have traditionally been the norm. Thanks to Timothy Moore for making both the original panel and follow-up interview happen. Below is the text as published, with some links I've taken the liberty of adding. The future is coming - but there are several of them. As a leader in foresight at Arup Australasia, Stuart Candy's task is to enable people to make considered choices about these potential futures, in the face of the complexity of the environment around them and its rapidly changing context. While he cannot predict what will happen, Candy works out various scenarios for the future by bringing people - and all their anxieties and aspirations - together. Timothy Moore As a part of Arup's Foresight and Innovation team, you identify and monitor the trends and issues likely to have a significant impact upon the built environment and society at large. You literally look into the future. How do you do this? Stuart Candy The heart of this work is about serving as a catalyst to enable, encourage and exemplify different ways of looking at things. It is about inviting and at times seducing people into a certain way of thinking, rather than mandating it. As the pioneering corporate futurist Pierre Wack put it, foresight is "the gentle art of reperceiving" - looking at the present in terms of the alternative potentials that it contains, to inform wiser action today. We set a process in motion whereby people can discover for themselves the choices they face, and the future implications of various paths that might be taken. It's a different philosophy from that of the guru who distributes pearls of wisdom. It's intrinsically collaborative. TM How do you go about getting people to see possible futures in terms of making people realize that everyone plays a part in making architecture; that everyone is, in fact, building? SC There's a 1958 essay, "I, Pencil," written from the pencil's point of view. The pencil says, "not a single person on the face of this earth knows how to make me." Now, a pencil seems a basic enough artefact, but this pencil has a point: there's far more to it than meets the eye, so no individual knows every detail. It's a complex synthesis of different skill sets and knowledge bases. If that's true of a pencil, its obviously the case for the scale and complexity of things produced by architects and engineers. Nobody can know everything about any project, so what matters is the process of bringing the elements and expertise together to make it possible anyway. We're co-creating these highly complex design outcomes. And this is also true of the future overall. What we get is the product of everyone's actions, which is just one of many imaginable pathways. TM By going into the future, there is more uncertainty because of the increasing number of unknown variables. The Long Now Foundation, of which you are a research fellow, looks ten thousand years into the future in order to encourage tong-term thinking. SC The "long now" is an invitation to see the whole of human history, past and future, through a wide-angle lens. That time horizon comes from the approximate birthdate of agriculture, about ten thousand years ago. It's a seriously big-picture challenge, a time span three or four orders of magnitude longer than most of us are used to thinking, and a terrific provocation to the culture at large. But in most organizations, the relevant version of this challenge is to stretch our collective time horizon out even a decade or two. Certainly, multi-decadal time spans are directly relevant for the buildings, infrastructure and urban environments that we at Arup help to shape, but they are well beyond the typical attention span of most businesses, politics, media and even education. One thing that a "long now" view makes clear is that different layers of change occur at different rates. For instance, you can't really see or say anything meaningful about climate change on the timescale of a few months or years, so you have to tune your attention in to different timespans, like different radio frequencies, in order to pick up the signals. TM Do people mistake you as a prophet, because you are far-forward thinking? SC I think there's a pretty deep atavistic impulse towards prophecy in our culture, which we're very slowly coming to outgrow. The fact that nobody can predict the future should be a clue to the fact that the future is not predictable. Still, some people want bold predictions to act on (or argue with), and hope against hope that you'll provide them. And some so-called futurists are happy to oblige. For now, it seems being a guru is easier to sell than being a thought partner or catalyst. The former is philosophically and politically dubious. The latter is a harder sell, but it has the advantage of being true. The greater service is to help people towards their own deeper and more thoughtful understanding of change. We provide opportunities for them to become comfortable explicitly acknowledging the degree of ambiguity and uncertainty that's really in the system. And this is surprisingly empowering. Seen this way, the future is a landscape of potentials, and the result of thinking about futures in plural terms is that you can prepare for multiple outcomes and (within your domain of influence) act towards those possibilities you'd like to see happen. This is common sense, but we need to be reminded of it regularly. TM How is this philosophy demonstrated in your work at Arup? SC The first external project that I did with Arup in Australia (after moving from the US in late 2011) was for the CEO and executive team of the Sydney Opera House (the original design and build of which was the project that put Arup on the international map). This engagement was about considering some upcoming renovations in a broader context of change. They have three years worth of performances booked already. So when a facility like this wants to change any physical aspect; for example, if they want to do a renovation or a new build, they must factor in significant lead times, and it can take up to five years from planning to project completion. That's half a decade of rapid change, and for a cultural organization in the midst of a technological revolution in how people access and consume cultural artefacts - consider that the iPad didn't exist three years ago - this has big implications for how any renovation process might proceed. Generally, we shouldn't simply plan for today's problems (and opportunities), because by the time we've solved those, there will be different ones. You can be sure that the people, businesses and places you're designing for will keep changing. Especially when you talk about a design with a life expectancy of decades or longer, down the track that design may be part of a world that's radically different from today. In this light, it suddenly becomes obvious that thinking systematically and creatively on these longer timeframes is not just a nice thing to do, it's crucial to doing good work.